Q) Beyond your freelance work and other paid writing gigs, you’ve been a dedicated blogger for a long time. How did turning your experience into a book by “writing what you know” help with the writing process? Lauren: When I was first drafting out the book, my personal experience heavily influenced what I wanted to cover. I did a rundown of all the questions I had about blogging at the beginning, and decided to deliver my answers to them in order. However, as I kept it up this way, I realized I frequently had the urge to add the caveat, “this is what worked for me; there are so many other ways to do this!” after my explanation. That’s when I realized this was a book that could benefit hugely from a lot of different anime bloggers’ perspectives, not just my own. Once again, my experience as a writer really helped here with generating interview questions and conducting professional, productive interviews with my sources. Q) How long did Build Your Anime Blog take to create from concept to completion? Technically, a year. Last year I surveyed my readers and asked them “If I wrote a second book, what would you want it to be about?” More readers said they’d like an anime blogging tutorial than anything else. In March I decided I wanted to make this happen finally, and came up with the idea to contact twelve other blogs for interviews. I did six interviews a week for two weeks while writing up the first quarter of the book in the mornings. I spent April editing and formatting, and finally launched the book on May 1. Q) Can you tell us more about your approach to this project and offer any insights on what helped you write, produce, and launch this book so quickly? Any tips you can offer readers? If you want to work fast and finish fast, you have to treat a project like this like your job, not like some optional hobby activity. When it comes to a big project like a 50,000+ word book, it also helps to divide it into smaller tasks. I had a huge checklist with things like “Interview 1 transcription” and “Write monetization section” with the goal to get through three of the tasks on the list every single day. Breaking it up into such small, manageable goals kept me from getting overwhelmed. Accountability was also a major factor. In March I told my readers, “This book will be available for purchase on May 1.” So I kind of had to make sure that happened, or else I’d be a liar. My first book, Otaku Journalism, took me about a year to publish and that’s ridiculous. Think of all the other projects I could have brought to fruition in that time. So now I make an effort to work fast so I can experiment with more things. Q) So while some of your books are self-published, you’ve also got a few books in the pipeline through a traditional publisher. Could you talk about what that hybrid author experience has been like for you, and do you see any challenges or benefits of either approach? Working with a publisher appears to be the dream, because it supposedly offers legitimacy to your book. However, publishing houses are as broke as everyone else, and unless you’re famous, a book deal is not a career. My two traditionally published books involved a payment upfront and that’s it. No matter how the book sells, I do not see a cent. I could not care less if you buy my books! No, that’s not true, I’d like you to read them, but I do not benefit financially if you do. Meanwhile, self-publishing is a lot more lucrative, flexible, and fun. I can come up with an idea and publish it two months later. I can receive royalties as long as the book continues to sell. I do not have to answer to an editor and if I want to use weird words like “otaku” or explore a SUPER niche topic, I can. If you want to make money, self publishing is the way to go. But if you want to impress your friends while weeping over your bank account, traditional publishing is your best bet. Everyone is way more impressed about my book deals than my self published works, though they have affected my life half as much. Q) I know your latest book is specifically geared towards anime bloggers, but I found a lot of the advice in it was useful in regards to just blogging in general. How could readers who may not be into anime but have another favorite topic they want to build a blog around use this book to do that? Six years later has proved that theory and I think my book is an excellent case study for people wondering if you can really find success blogging about that obscure niche you love. Grab Lauren’s new book today! 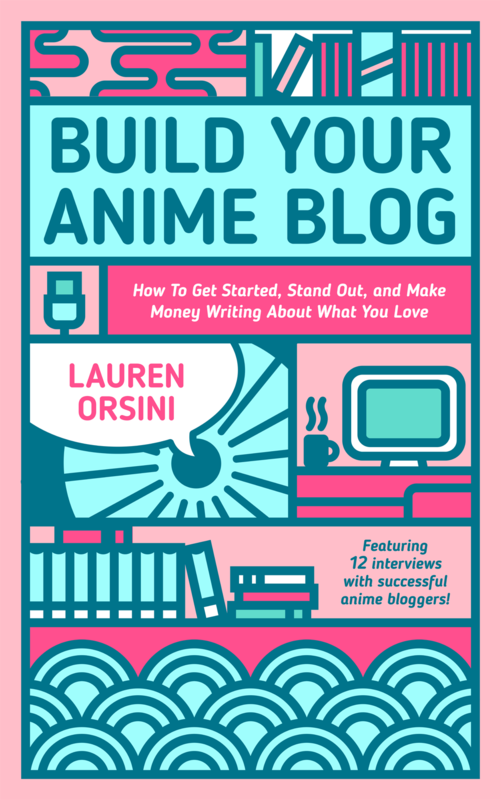 Whether you’re into anime or not, I highly recommend you check out Build Your Anime Blog: How to Get Started, Stand Out, and Make Money Writing About What You Love, out NOW on Kindle! It’s a great read and has some really useful insights into startingy our own niche blog, anime or otherwise. Also, I wanted to extend a big thanks to Lauren for taking the time to share her self-publishing experiences with us! This entry was posted in Freelance Game Journo Shop Talk, Shop Talk, Shop Talk Interviews, Uncategorized and tagged anime blogging, author interviews, build your anime blog, how to build a blog, indie books, kindle books, lauren orsini, nathan meunier, self-publishing, write short kindle books by nmeunier. Bookmark the permalink. Onee of the many things thaat is so great with Peppoa Pig Toys iss the fact that they are interactive.